[By Nick] I would like to start this post with a big thanks to everyone over at The Gelato Fiasco for inviting me to Maine last weekend for an amazing time. You see, I have been talking with Josh (one of the founders) about visiting them for awhile now and I finally had a chance to take the trip. If you followed me on Twitter, you would have seen a good portion of what happened already but let's start from the beginning. After checking into my hotel, I made my way over to their flagship store in Brunswick. When I say made my way, I got lost and ended up at a Rite-Aid because my GPS obviously hates me. After finding the shop, Josh greeted me and my friend Frank. After a little talking, I stuffed in 26 samples of different flavors in around 5 minutes. To say I was in heaven was an understatement. I was ready to move into their shop right then and there. I mean they even have a freezer for pints to take home right in the store! They also have a thing that when there are left over flavors, they pack them into pints. These become "mystery flavors" and is one of the greatest ideas I have ever seen. 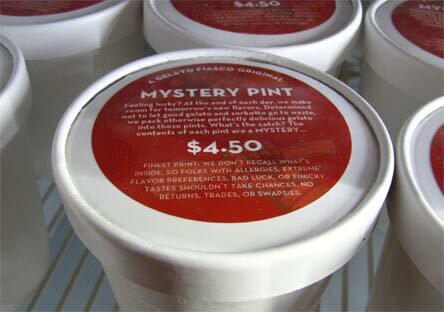 Sure, those with allergies or are picky might not approve but they are also a bit cheaper than their normal pints. Just don't be a cheater and try to peek under the lid. That ruins all the fun. Okay, back to business. After giving us a tour of the back of the shop where they churn out flavors for the store, we headed over to their production facility not too far away from the shop. I didn't grab many photos because honestly, there's not much to it. This facility isn't some massive place like you'd find with other brands. Since The Gelato Fiasco recently moved to this spot and are already outgrowing it. This is where they make the mixes for their shops as well as the pints for retail. They were finishing up a batch of Strawberry Balsalmic Sorbetto while I was there. If you were wondering, it smelt pretty good in there. Oh and have you ever wondered just how they make sure the product settles and there are minimal air gaps in a pint? Well here's a video for you. That must be a great stress reliever if you ask me. After that, we went to heaven, also known as their walk-in freezer which was filled with pints ready to go out for distribution. If I can't live in their shop, I would settle for living in this freezer. After all this, it was time to head to Portland. I know this is about frozen desserts but he took us to The Holy Donut which makes potato donuts. You read that right. My friend grabbed a cinnamon one while I got a dark chocolate cinnamon and they were beyond glorious. I might just be ruined when it comes to donuts for the rest of my life. 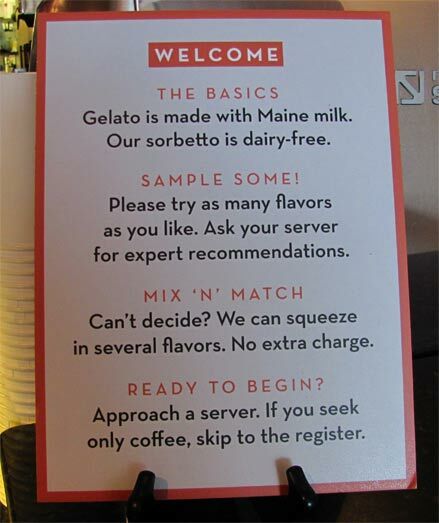 Okay back to the gelato, while we did go to their Portland shop, I didn't try any flavors there just yet. I had some recon to do. There's a gelato shop in the area who thinks there's some sort of feud between them and The Gelato Fiasco. 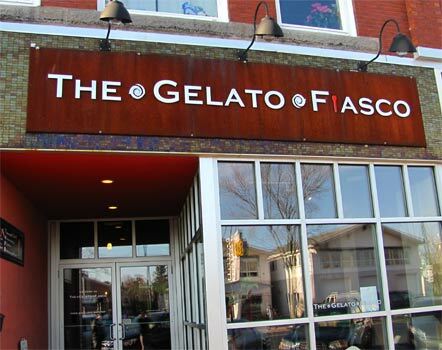 The claim to be the only gelato in Portland and the best in all of New England. It's obvious to say they're neither of those. 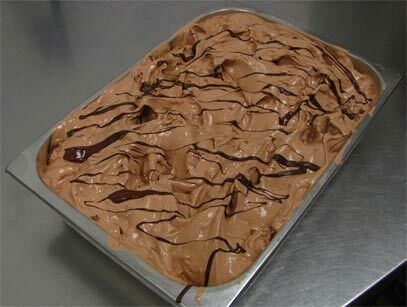 While they do have a great marscapone and fig gelato, their dark chocolate sorbetto has nothing on The Gelato Fiasco's and their salted caramel gelato had no saltiness to it at all. Speaking of figs and since I'm never full we stopped to get "snacks" at Infinium. Note to self: Never let Josh order small plates again. So much food but the pizza with figs was beyond glorious. I'll say it before and I'll say it again, give me more figs! Now time for some ice cream! Josh heard about this place called Catbird Creamery that he wanted to check out. I didn't grab any photos here minus a sign outside because I think I was still delirious from all the food I had consumed. This little shop has some good flavors though. The lemon thyme was my favorite of the handful we tried. Nice mild citrus flavor and almost had a limoncello quality to it. I could easily eat a pint of that on its own. After that we had to go back to the Portland shop because I had some flavors left to try there. After that barrage of samples, we made it up to 50 flavors for the day and I had yet to be disappointed by one of them. However my body was craving caffeine and vegetables. I grabbed myself a nice, warm cup of black God of Thunder coffee they brew at their shops to satisfy the caffeine need. This stuff is really good and that's coming from someone who doesn't like coffee. 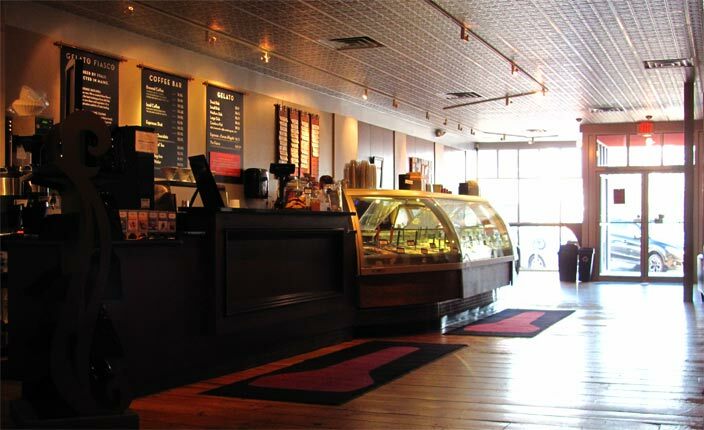 They also offer affogatos at their shops so you can get your gelato and coffee fix in one! We then headed off to Frontier in Brunswick after Josh gave us another tour of that area. I ended up with a delicious plate of something that satisfied my veggie needs. As you might suspect, I started to get more and more delirious as the day went on. After that food, we headed back to the Brunswick shop to set up things for the next morning (get real photos, sample more flavors, see how gelato is made for the cases, etc) I'm a glutton for punishment though and saw there was 3 flavors I had yet to try. I ended my day trying 53 flavors and those last three samples basically did me in. The next morning, I was somehow alive and hungry for more gelato. Okay, that's a lie. As any of the employees could tell you, I basically kept laying on their couch in-between tasks. First up was to grab some real shots for this post here while there were fresh batches being churned in the back. After my multiple collapses on their wonderfully comfy couch and some samples of flavors I've yet to try, it was time to see a batch be made for the shop. Brett first did their chocolate mint chocolate chip gelato which I tried fresh out of the machine. I think I might be ruined for the rest of my life when it comes to gelato. It was a life changing experience. I did get a video of him making the raspberry truffle sorbetto that Dubba reviewed not too long ago. Once again, I tried this fresh and it was beyond amazing. I could definitely get used to that. After all this, I think we made it up to 61 flavors and had to stop at the Portland shop because they had a few that weren't available the day before and it was on my way back home anyway. So three samples later from the lovely Juliet and I had now tasted a total of 64 flavors in 24 hours. I deserve a medal or an insulin shot. I'm not 100% sure which yet though. Thank you guys for sticking around with this extremely long post and I'd like to thank everyone at The Gelato Fiasco again for an amazing weekend and can't wait to come back! Now here's a list of my Top 5 flavors from the trip that haven't been reviewed on the site yet. Maybe I'll update this to a Top 10 if there's enough curiosity but this post is long enough as is. I mentioned I had this one fresh and it was just as great when it had chilled for service. (Yes, I had two sample of it, for science!) I love flavors that combined chocolate and mint in the base and that's no different here. Add in the fresh made chocolate chips and you have my favorite mint gelato and my favorite mint chocolate combination behind Ben & Jerry's Chocolate Peppermint Crunch. Have you had the dark chocolate roasted pistachio toffee from Trader Joe's? This tastes exactly like it just with a little less chocolate flavor. I love that product and this is easily my new favorite flavor that uses pistachios. Must try for pistachio lovers for sure. Don't let the name discourage you, this stuff is amazing. It's available in pints as of now but might be getting a change of name soon. The combination of caramel, chocolate and almonds was delicious. It reminded me of something else I had had before but I still quite put my taste buds on it. I actually got a dish of this with my #1 flavor for breakfast the next morning. The name says it all. They use the same perfect peanut butter base ad their Peanut Butter Stracciatella but ditch those chocolate bits for brownies. It was at the Portland shop and I was saddened when there was none left the next day when I stopped in. This should be made into pints asap. If #2 needs to be in pints asap, this one needs to be in pints immediately. This was the featured flavor of the weekend and one of the best flavors I have ever had in general. Nothing dominated the other and each component worked to compliment each other perfectly. This knocks Coolhaus from being my favorite cheesy frozen dessert. I see this one making a lot of returns to their shops and into your freezers soon enough. Once again, I can't thank The Gelato Fiasco crew for taking me in like family and treating me to a weekend I'll never forget. If you ever find yourself in Maine, you have to stop in at one of their stores!